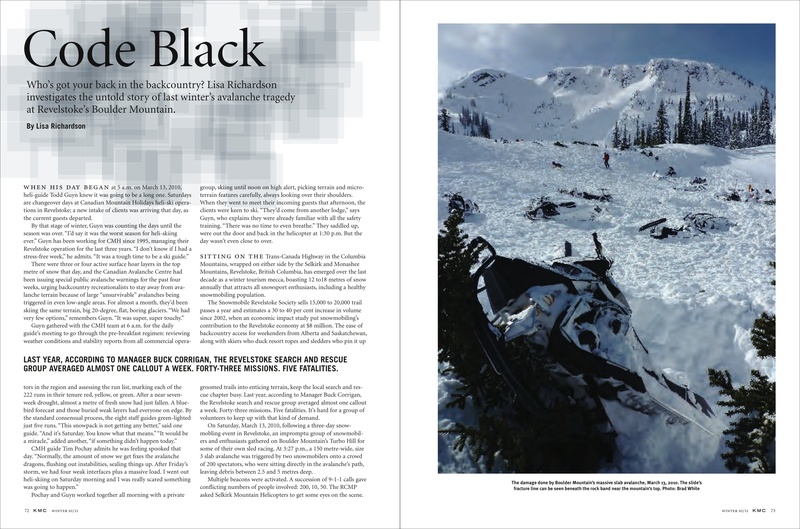 “Why go over it again?” people asked, when I told them I was writing an article for KMC mag about the second biggest avalanche disaster in Canadian history. People died. There’d been enough finger-pointing. And there was enough media coverage at the time to wear everyone raw. But I’ve lived in a (distinctly non-morbid) house where the bedside table reading is frequently Accidents in North American Mountaineering. When you rockclimb, you know of every crag or climb that someone has been killed on. (More climbers die from hitting the ground than anything else.) When you approach those pitches, there’s a little hush and tremor laid over everything, this is where that guy decked, this is where that girl was killed by rockfall, a reminder that if you don’t pay attention, if you don’t double check your harness and your knots and your belay device, if you get complacent, then the stakes are as high as they get. In the mountains, you learn by case studies from the worst-case-scenarios. Plus, there were stories that hadn’t been told. Like the fact that the rescue effort was accomplished by 49 commercial ski guides and ski patrollers from Selkirk Tangiers Heli-skiing, Revelstoke Mountain Resort and Canadian Mountain Holidays who dropped everything in the middle of their work days to attend a scene of devastation, perform first aid, and helicopter victims off-scene. 12 pilots, all commercial operators, managed their own air-space, to evacuate the scene. And the front-line rescue effort was accomplished by the sledders on-scene, the immediate survivors. They performed self-rescue, and managed to unbury every single victim by the first fly-in – a remarkable feat. But as much as we would like to tidy the world into neat columns – good guys vs bad guys, fate vs poor choices – things just aren’t that neat. Luck, grace, expertise, good decision-making, poor judgment, sledders, skiers, and avalanche dragons are all out there in the backcountry, mixing it up together at any given time. And the better we can understand all the elements at play, the better decisions we can make. Previous Post PR is dead. Long live the storytellers. I wouldn’t say this is the second biggest. Search for all avalanche incidents and sort by fatalities or involvement. It doesn’t really measure up. I think it was the biggest screw up at a single event every though.